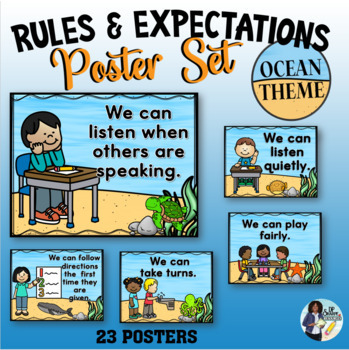 This is a set of classroom rules and expectations posters to display in your classroom with an ocean theme. Each poster features a matching picture. The set includes 18 classroom rules for you to choose what works best for your classroom. Each rule comes in two styles: “I can’ or We Can” statements. You also receive an editable version to add your own rules! These are the included rules: We can listen when others are speaking. | We can keep our hands and feet to ourselves. | We can use our quiet voices. 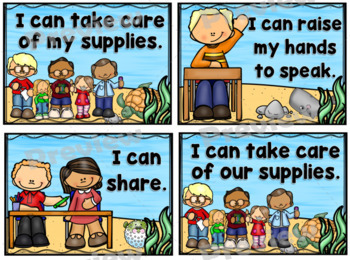 | We can take care of our classroom. | We can walk quietly in line. | We can follow directions the first time they are given. | We can always do our best. | We can raise our hands to speak. | We can share. | We can treat others with kindness and respect. | We can sit in our seats correctly. | We can take care of our supplies. | We can listen quietly. | We can respect all adults. | We can line up quietly. | We can play fairly. | We can use our inside voices. | We can help each other. Click the link below for more ocean themed products.